Name: "Agu" is most probably short for the Japanese word "agurabana," which means a wide, flat nose. 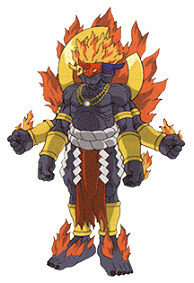 Agunimon is the Warrior of Flame, the Spirit Evolved form of Takuya using the Human Spirit of Flame. Strong, fast and agile, Agunimon can generate and control fire in various ways. The Spirit of Flame was the first of the Spirits discovered, when Cerberumon attacked the Village of Flames and the DigiDestined were caught in the middle. The battle unearthed the spirit, and Takuya claimed it, transforming into Agunimon for the first time. He destroyed Cerberumon, scanned his Fractal Code, and restored the destroyed portion of the Village of Flames. Takuya next became Agunimon to defend Koji and Tommy against Raremon, but reverted back before he could defeat the creature, leaving Koji to become Lobomon to destroy it. 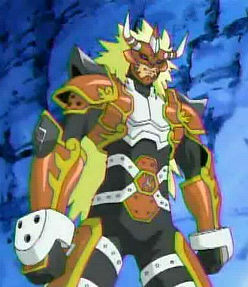 Agunimon was similarly unsuccessful when he next appeared to battle, his fire attacks doing no damage to Candlemon, but with help from Kumamon, he was able to defeat the Wizardmon that one of them Digivolved into, convincing the other Candlemon that they were Legendary Warriors, and gaining safe passage out of their valley. 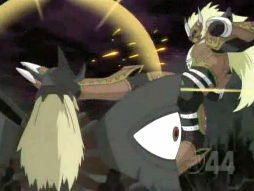 Agunimon made his next appearance in the attempt to liberate the Kokuwamon from under the rule of Snimon. In a hand-to-hand battle with the villain, however, Agunimon was overpowered, leaving Beetlemon to defeat Snimon. When confronted by Grumblemon for the first time, Agunimon and Lobomon clashed in their attempts to battle him, getting in each other’s way. As they began to work together, however, Grumblemon revealed his Beast Spirit Evolution, Gigasmon, and shattered the mountain, scattering the kids. Takuya, Koji and Tommy wound up on the floating island of the ToyAgumon, where they were caught up in battle again against the ShadowToyAgumon. As Agunimon and Lobomon, they confronted the assorted combined shapes and forms the Digimon took on, eventually purifying them by scanning their Fractal Code and returning them to normal. The ToyAgumon flew the boys back down to ground level, where they were reunited with their other friends, and went on to spend the night in the TV Forest. There, Bakumon mesmerised Kumamon, and Takuya was forced to Spirit Evolve into Agunimon to hold him back, only to succumb to Bakumon’s powers as well. He was able to fight it off, and, realising what Kumamon was suffering from, defeated Bakumon and broke his spell over him. When the kids were pursued to Shamanmon’s temple by Grumblemon and his Golemon, Agunimon took his rocky opponent down. The fight was interrupted by the sudden appearance of BurningGreymon, who sent Grumblemon fleeing, leaving Takuya to realise the truth – that Shamanmon had been overtaken by the Beast Spirit of Flame. Takuya saved him by taking the Spirit for himself, becoming BurningGreymon, only to discover he had no more control than Shamanmon had. It was only thanks to Tommy that he brought the raging beast under control, and went on to use its power in battle with Grumblemon, switching from Agunimon to BurningGreymon to defeat the villain and claim his Beast Spirit. During the kids’ adventure on the Lost Island, Takuya became Agunimon to halt a battle between warring sides of Human and Beast Digimon. When another battle erupted later, he became BurningGreymon, but when the war was revealed to have been fostered by Murmuxmon to revive the evil Onismon, he Slide Evolved into Agunimon to deliver the final blow to Murmuxmon, destroying him and allowing AncientGreymon and AncientGarurumon to stop Onismon. This adventure is out of continuity with the ongoing series. Thirsting for revenge, Grumblemon called in his fellow “evil” Legendary Warriors, who battled the DigiDestined in Seraphimon’s castle. Agunimon had his fire doused by Ranamon’s Draining Rain, and the defeated kids made a narrow Trailmon escape. The escape tunnel brought them out in an underwater cave, where a Whamon was trapped, and Agunimon and Lobomon tried to help him. Grumblemon and Arbormon then attacked, and Arbormon immobilised the two Hybrids while Grumblemon attacked the others. It was only thanks to Whamon’s regurgitation of the Beast Spirit of Thunder that allowed J.P. to become MetalKabuterimon and destroy Grumblemon. Agunimon next appeared to aid Korikakumon in battle against Petaldramon, then later, during the Great Trailmon Race, Takuya Spirit Evolved again to tussle with the cheating ShadowWereGarurumon atop Worm. Subsequently, the kids ventured into the Dark Continent, heading for the Rose Morning Star, and were soon defeated by Duskmon, the Warrior of Darkness. Takuya and Koji clashed again over strategy for renewing their attack on him, but Agunimon lead the charge, leaving the others no choice but to follow. 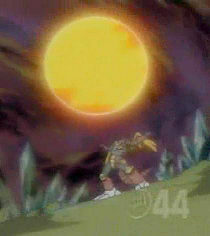 Agunimon went one-on-one with Duskmon, and discovered his power could not match the dark warrior’s. As Duskmon was about to deliver the final blow, Koji intercepted it, causing Duskmon to react mysteriously. Darkness shrouded the landscape, and Agunimon reverted into Takuya, finding himself at the Dark Terminal. Returned to Earth by DarkTrailmon, his vigour was renewed by the realisations he had there, and he opted to come back to the Digital World, only to find that most of his friends were captives of Ranamon and Mercurymon. After saving Bokomon and Neemon from a Sepikmon, Agunimon befriended him, and he helped find their captive friends with his Spirit Boomerang. Now truly understanding what it meant to be a Digimon, Agunimon harnessed the natural power of the Digital World around him, and entered the fray, liberating his companions, and, together, they routed the two evil warriors. When the group was attacked without warning by Sakkakumon, Mercurymon’s Beast Spirit Evolution, they were trapped within his massive frame. 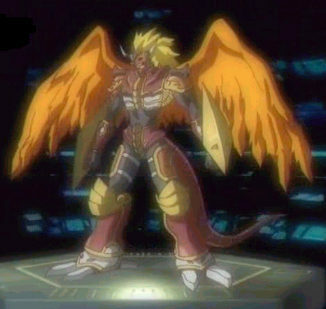 Takuya Spirit Evolved into Agunimon to battle Sakkakumon's internal defences along with the others, then they were split up, and after some time, Takuya found himself in one of the Sakkakumon's spheres, where he became Agunimon to battle the Parrotmon that attacked him, defeating it quickly. Later still, Takuya Spirit Evolved again to battle IceLeomon in another, icy sphere. The conflict was brutal, but when it’s fire against ice, fire always wins, and Agunimon claimed victory. A portal to the outside consequently appeared, but Agunimon elected to remain within Sakkakumon to find and help Koji – only to watch as his explosive battle with Duskmon hurled him and the dark warrior outside. As the only DigiDestined left within Sakkakumon, Agunimon was confronted by Mercurymon, whose mirror-shifting powers enraged and confused the Warrior of Flame. When Mercurymon used Seraphimon’s stolen data to become ShadowSeraphimon, Agunimon became BurningGreymon, but neither form could withstand the black angel’s power. With the power of Fusion Evolution bestowed upon him by Seraphimon’s egg, Takuya was able to become Aldamon, overpowering the villain, reclaiming both Seraphimon’s data, and the Human Spirit of Steel. With this new power, Takuya had less need to Spirit Evolve into Agunimon. The next time he did so was to battle the Phantomon guarding the castle at the Rose Morning Star. The group the ventured into the castle, and were led to the captive Ophanimon by Oryxmon, only to be confronted by Cherubimon. Agunimon reverted into Takuya, who then Fusion Evolved into Aldamon to battle Cherubimon. With the aid of Ophanimon, however, another new power was revealed, as Takuya and Koji used all the Spirits to achieve Unified Spirit Evolution, become EmperorGreymon and MagnaGarurumon. The defeat of Cherubimon saw the rise of the Royal Knights, servants of Lucemon, and when Baromon appeared to tell the kids of this, they all Spirit Evolved, thinking him an enemy before reverting back to hear his tale. Subsequently, the first clash between the DigiDestined and the Royal Knights occurred, which saw the kids blasted to one of the Digital World’s moons. There, Takuya became Agunimon and tried out assorted schemes to get the kids back to the planet below – MetalKabuterimon’s plan to shoot Agunimon out of his cannon did not exactly meet with success. The discovery of a rocket allowed them to return to the Digital World, where they encountered another group of four kids in Steel Town. Takuya become Agunimon to join in the battle against Sagittarimon and his Centarumon. The last time Takuya Spirit Evolved into Agunimon was during the battle at the Village of Beginnings, where all ten Legendary Warriors, even the formerly evil, now purified spirits, faced off against the Royal Knights – alas, they were still unable to save the data of the village. 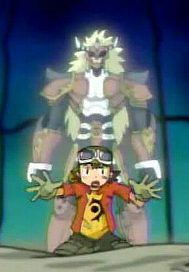 Takuya did not become Agunimon again, requiring the greater power of EmperorGreymon to battle the Royal Knights, but when Lucemon entered the real world, and all hope seemed lost, the spirits of Agunimon and all the other legendary warriors appeared before the kids, and spurred gave them the courage and power to fight on. With Lucemon’s Wild Mode defeated, Agunimon and the other spirits manifested once more to deliver the final series of blows that destroyed his Larva Mode. With a final handshake, Agunimon hurled Takuya through the portal back to the real world. Agunimon first appears in “All Aboard.” His voice is supplied by Michael Reisz, except in "Island of Lost Digimon," where Dave Wittenberg fills in both as Takuya and as his Digimon forms. Name: From “Agni,” the god of fire in Hindu mythology. When the kids can’t agree on the next course of action they should take, Bokomon suggests turning to Shamanmon for some fortune-telling aid. Shamanmon’s predictions come true very soon, as Grumblemon attacks his temple with a Golemon – and as the battle rages, Shamanmon uncovers the Beast Spirit of Flame, and is overcome by its power, transforming into BurningGreymon. Gigasmon flees before BurningGreymon's power, and Agunimon tries to help Shamanmon, overpowering him in battle and taking the Beast Spirit for himself. But its power immediately takes a hold of him, and he becomes BurningGreymon – a threat to his friends, and himself! Five Airdramon were among the Digimon who attempted to defend the Autumn Leaf Fair against the Royal Knights. Three of them were destroyed with ease by Dynasmon, and Crusadermon was prepared to deliver the same fate to the remaining two, until EmperorGreymon and MagnaGarurumon intervened. The Airdramon urged the two heroes on, telling them that only they had the power to save the Digital World. The Airdramon appear in “All Aboard The Tag Team Express.” The voices of the two who speak are supplied by Tom Fahn and Dan Lorge. Name: From “air,” and “dragon,” which “dra” is short for. Aldamon is the Fusion Evolved form of Takuya, formed when the two Spirits of Flame are used in conjunction, with the power to summon and project destructive spheres and blasts of flame. The power of Fusion Evolution was awakened by energy from Seraphimon’s egg, given to Takuya while he was battling Mercurymon within Sakkakumon. The villain had taken the form of ShadowSeraphimon, but upon becoming Aldamon for the first time, Takuya managed to defeat him with his Atomic Inferno, and reclaimed Seraphimon’s stolen data. 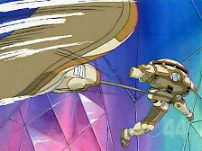 Using his Solar Wind Destroyer to vaporise Mercurymon’s mirrors and remove his mirror-shifting powers, Aldamon punched clean through the felon’s chest, destroying him, and claiming the Human Spirit of Steel. However, with the kids then having escaped Sakkakumon, Sakkakumon himself attacked the kids with their own powers, and Takuya became Aldamon again to battle him. 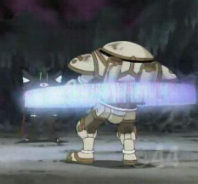 The kids attempted to escape underground, but were pursued and toyed with by Sakkakumon, turning them against each other, until Aldamon was able to organise them and combine their attacks into ones that Sakkakumon could not duplicate, revealing Sakkakumon’s central orb, his weak point, which Aldamon then struck, destroying him and claiming the Beast Spirit of Steel. The group then went on to search for Koji, who was embroiled in battle with Duskmon, only to be attacked by Cherubimon, who buried them under a mass of spires. Takuya became Aldamon to join in the escape effort, tunnelling out when their attacks failed to destroy their prison. After Duskmon was revealed to be Koji’s twin brother, Koichi, and Slide Evolved into his Beast form of Velgemon, Koji was unwilling to fight him until Takuya, as Aldamon, convinced him it had to be done to save him. Together, Aldamon and Beowolfmon defeated Velgemon, and Koji claimed the Spirits of Darkness, freeing Koichi. 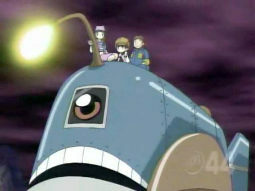 On the way to the Rose Morning Star, when the kids were attacked by a projection of Cherubimon, Takuya became Aldamon once more to participate in the battle – but it was Koichi, using the purified Spirits of Darkness, who destroyed Cherubimon’s image, clearing the way for the kids to reach his castle at the Rose Morning Star. Once there, they were faced with the real Cherubimon, and Takuya discovers that Aldamon’s power was not enough for this battle. Ophanimon bestowed upon Takuya and Koji the power of Unified Spirit Evolution, allowing them to become EmperorGreymon and MagnaGarurumon, and, after a brief altercation with IceDevimon, they used their new forms to finally destroy Cherubimon. But the destruction of Cherubimon saw the rise of the Royal Knights, servants of Lucemon, and Takuya Fusion Evolved into Aldamon for their first battle, tackling Dynasmon along with Beowolfmon. The Knights proved too much, however, and the ferocity of the battle blasted the kids to one of the Digital World’s moons. Aldamon first appears in “Darkness Before the Dawn.” His voice is supplied by Michael Reisz. Name: A corruption of his Japanese name, “Ardhamon,” which is derived from “Ardhanarisvara,” an entity from Hindu mythology, formed through the combination of Shiva’s male and female aspects. When Takuya Kanbara receives a mysterious message on his cell phone, he seizes the chance to escape from his humdrum life and races to follow the message’s instructions Briefly crossing paths with Koji Minamoto, Takuya soon finds himself aboard a train... to another world! Along with Zoe, J.P. and Tommy, Takuya finds himself in the Digital World, and it’s not long before trouble strikes in the form of Cerberumon – but through the power of the uncovered Spirit of Flame, Takuya Spirit Evolves into Agunimon, and defeats Cerberumon. And that’s just the beginning of their adventures...! Episode Trivia – As the first episode of the show’s fourth season, “All Aboard” was the first episode to air in the show’s new timeslot on UPN. J.P. takes the lead on the kids’ trek through the Dark Continent, but there’s nothing he or anyone else can do to stop the kids being sucked up by Sakkakumon, Mercurymon’s Beast form. The kids are split up into different spheres within Sakkakumon, and J.P. is confronted in succession by Volcamon, and a dark version of himself, first as Beetlemon, then as MetalKabuterimon, who make him doubt his friendship with others. He defeats his dark copy in the squared circle, cheered on by his friends, but then Sakkakumon splits them up again. The Legendary Warrior of Thunder, one of the ten mighty Digimon who rose up to depose the tyrannical Lucemon and free the Digital World from his rule. AncientGarurumon is the Legendary Warrior of Light, one of the ten mighty Digimon who rose up to depose the tyrannical Lucemon and free the Digital World from his rule. In his lifetime, AncientGarurumon, along with AncientGreymon, also battled another evil – Onismon. They successfully defeated the evil creature, and sealed him away on the Lost Island, but, years later, after the coming of the DigiDestined to the Digital World, Onismon was unleashed again thanks to the machinations of Murmuxmon. The pleas of Kotemon revived the two Ancient Digimon, and they used their power to destroy Onismon before vanishing again. Name: From “ancient” and “garuru,” the sound of a growl in Japanese. AncientGreymon is the Legendary Warrior of Flame, one of the ten mighty Digimon who rose up to depose the tyrannical Lucemon and free the Digital World from his rule. In his lifetime, AncientGreymon, along with AncientGarurumon, also battled another evil – Onismon. They successfully defeated the evil creature, and sealed him away on the Lost Island, but, years later, after the coming of the DigiDestined to the Digital World, Onismon was unleashed again thanks to the machinations of Murmuxmon. The pleas of Kotemon revived the two Ancient Digimon, and they used their power to destroy Onismon before vanishing again. Name: From “ancient” and “great,” which “grey” is a misspelling of. The Legendary Warrior of Wind, one of the ten mighty Digimon who rose up to depose the tyrannical Lucemon and free the Digital World from his rule. The Legendary Warrior of Ice, one of the ten mighty Digimon who rose up to depose the tyrannical Lucemon and free the Digital World from his rule. Name: From “ancient” and “megatherium,” an elephant-sized prehistoric mammal from the Ice Age. The Legendary Warrior of Water, one of the ten mighty Digimon who rose up to depose the tyrannical Lucemon and free the Digital World from his rule. Name: From “ancient” and “mermaid,” a sea-dwelling creature from fantasy, with the body of a woman and the tail of a fish. The Legendary Warrior of Darkness, one of the ten mighty Digimon who rose up to depose the tyrannical Lucemon and free the Digital World from his rule. AncientSphinxmon only appears in silhouette form in the series, first in “Better An Egg Than An Egg Shell. Name: From “ancient,” and “Sphinx,” the famous Egyptian monument. The process by which all twenty Spirits are united together in one evolution, transforming first Takuya and Koji, and then all the kids together, into Susanoomon. Ancient Spirit Evolution first occurs in "The Brothers Yin and Yang," but is not referred to by name until "End of the Line." The Legendary Warrior of Wood, one of the ten mighty Digimon who rose up to depose the tyrannical Lucemon and free the Digital World from his rule. Name: From “ancient” and “Trojan,” as in “Troy,” the city famous for its story of a wooden horse. The Legendary Warrior of Earth, one of the ten mighty Digimon who rose up to depose the tyrannical Lucemon and free the Digital World from his rule. The Legendary Warrior of Steel, one of the ten mighty Digimon who rose up to depose the tyrannical Lucemon and free the Digital World from his rule. Angemon was charged with the task of protecting Katsuharu, Teppei, Chiaki and Teruo by Ophanimon, when the four children wanted to remain in the Digital World after the selection of the DigiDestined. The DigiDestined first encountered him and his charges upon their arrival in Steel Town, when Angemon forced the Sagittarimon who had confronted them to flee. However, the DigiDestined immediately butted heads with the other four children, as they tried to convince them it was too dangerous for them to stay. Angemon took the DigiDestined aside, and explained to them why the four were there, as he too had been unable to convince them that it was safer for them to leave. 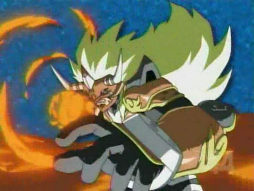 Sagittarimon chose that moment to reappear, bringing with him a small army of Centarumon, which Angemon immediately ploughed into and succeeded in holding back – but a second contingent of Centarumon attacked the children from behind, forcing the DigiDestined to reveal their Spirit Evolution powers to the other kids, startling Sagittarimon enough to allow Angemon to blindside him and punch him clean over the horizon. Afterward, the sudden appearance of the Royal Knights proved to be Angemon’s undoing, as he attempted to attack Dynasmon, and was immediately cut down and had his data absorbed by him. 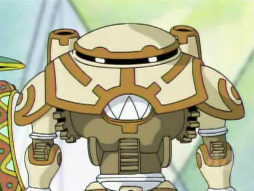 Angemon appears in “The Bully Pulpit.” His voice is supplied by Dave Mallow, reprising the character from seasons one and two. In a way, returning to the role was a way of coming full circle for Mallow, returning to his primary Digimon character, delivering more dialogue as him than ever before, and then having the character die. Quite final. Anglers are one of the several breeds of Trailmon who traverse and transport passengers over the far-reaching system of train lines that spans the Digital World. An Angler was one of the Trailmon waiting to bring kids summoned by Ophanimon into the Digital World, but the sole passenger he brought back was Koji Minamoto. While waiting at the Flame Terminal, where he left Koji, Angler was approached by J.P. and Tommy, who wanted him to go back to the real world. He refused, but when J.P. offered him a bar of chocolate, Angler gleefully accepted, and left at once – except he didn’t take the two boys with him. An Angler was one of the participants of the Great Trailmon Race, but because multiple numbers of each breed of Trailmon exist, there’s no way of knowing if this Angler was the one the kids had previously encountered. When the various Trailmon’s riders were scared off by the threat of facing ShadowWereGarurumon in the race, the DigiDestined filled the empty slots, with Tommy riding Angler. Thanks to ShadowWereGarurumon’s cheating, a canyon bridge in the race was destroyed, and Angler nearly met a nasty end before Tommy became Kumamon and created an ice bridge to carry him to safety. Yet more cheating on their opponent’s part resulted in Franken and Lobomon going over the edge of a cliff, and although Kumamon grabbed Franken, Angler couldn’t hold their weight, and went over the edge as well. Thankfully, Lobomon Slide Evolved to KendoGarurumon and broke their falls, but it put Angler out of the race. Some time later, when the kids had made their way into the Dark Continent, Tommy, J.P. and Zoe found themselves in the Trailmon Graveyard, a wasteland where old Trailmon came to die. There, they encountered an elderly Angler, who offered them information on the Rose Morning Star in exchange for making his last hours enjoyable. He milked the opportunity for all it was worth, but just as he was finally about to tell the kids what he knew, the moment of death seemed to come upon him... only for it to turn out that he was regenerating into his healthier, younger self. The angry kids were about to rough him up a little, but relented, and he finally revealed that he had been forced by Cherubimon’s henchmen to transport Ophanimon to the Rose Morning Star. Once the DigiDestined all got together again, Angler transported them to the Rose Morning Star, though on the way, they were attacked by a projection of Cherubimon, and Angler was kicked over the horizon. Shortly after the defeat of Cherubimon, when the Royal Knights began to gather more of the Digital World’s data for Lucemon, all the assorted Trailmon were unwilling to travel their routes and put themselves in danger. An Angler was among the Trailmon who refused to take the DigiDestined to Beanstalk Village, and was also one of the Trailmon who wouldn’t leave the safety of their station to help transport Digi-Eggs from the Village of Beginnings to safety. Thankfully, Zoe was able to convince them in the latter instance, and Angler was the last of the group to move out with the eggs, and Swanmon, taking them to safety on one of the Digital World’s moons. 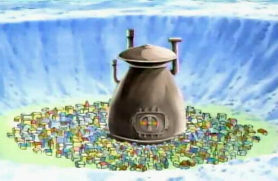 Following the destruction of Seraphimon’s castle and the surrounding area by the Royal Knights, an Angler transported the kids away, and when the last of the Digital World was destroyed and Lucemon was reborn, an Angler – one who had previously met the kids, as he knew who they were – scooped them up and got them to the temporary safety of the moon. An Angler first appears in “All Aboard,” but doesn’t speak until “Lobomon: Warrior of Light.” Dave Wittenberg supplies the voice of all the Anglers, and all the other Trailmon. Angler's voice is based on the voice of Heimlich the caterpillar (Joe Ranft), from Disney/Pixar's "A Bug's Life." Name: From “anglerfish,” a fish that lives in deep, dark waters, and has a luminous bulb on a stalk extending from its head. Angler’s design is based on this fish. Arbormon is the Warrior of Wood, one of the five warriors in Cherubimon’s service. Though brutish and simple in his both word and deed, Arbormon is also known to sprinkle proverbs, advice, and rules of thumb for better living into his speech now and then (occasionally breaking the fourth wall as he does so, giving the advice directly to the audience). He can extend his limbs for powerful punches and kicks, and can shoot explosive projectiles from his mouth. He also possesses the Beast Spirit of Wood, which allows him to Slide Evolve into Petaldramon. Arbormon first appeared when Grumblemon was defeated by the DigiDestined and had his Beast Spirit stolen. In search of revenge, Grumblemon led Arbormon and the other evil warriors, Mercurymon and Ranamon, to Seraphimon’s castle, where a battle ensued, and Arbormon took down Agunimon, Lobomon and Beetlemon with his Roundhouse Punt. The kids were able to escape via Trailmon, but Arbormon and Grumblemon pursued them to an underwater cave containing a trapped Whamon. While Arbormon occupied Agunimon and Lobomon, and also Slide Evolved into Petaldramon, Whamon regurgitated the Beast Spirit of Thunder, allowing J.P. to become MetalKabuterimon, and bring the cavern down in a cave-in, burying Petaldramon. After a short while, Arbormon was able to dig his way out of the cavern, and followed the kids' trail to the Toucanmon's restaurant, where he learned that the Toucanmon had stolen the kids' D-Tectors, and taken them to the Autumn Leaf Fair to trade them with Datamon. After calling ahead to confirm this, Arbormon headed for the fair, and ran into the Toucanmon on his way, capturing them and taking them and the camera they got from the trade back to Datamon, demanding that he trade the camera back for the D-Tectors. When Datamon refused, Arbormon became Petaldramon and began tearing the fair apart, until Datamon returned Tommy’s D-Tector to him, now with the Beast Spirit of Ice contained in it, enabling Tommy to become Korikakumon, who knocked Petaldramon off into the distance. Arbormon remained as Petaldramon during the DigiDestined’s next confrontation with him, as they attempted to rescue Burgermon from his hungry clutches. Then, when the kids entered the Dark Continent, Arbormon was the first foe they faced there, as he strengthened himself for the battle with the data of some Pipismon. He proceeded to become Petaldramon again, but this time, fell in battle to the combined power of the kids’ Beast Spirit Evolved forms. Lobomon scanned his data, claiming the Beast Spirit of Wood. Then, the unexpected happened. Duskmon, the Warrior of Darkness, appeared from the shadows, and Arbormon thought reinforcements had arrived – only to be abruptly be destroyed by Duskmon, as he felt he no longer served a purpose. When the time for the final confrontation with Lucemon came, the spirits of all ten warriors appeared to the kids, giving them the strength to fight on. With Lucemon’s Wild Mode defeated, Arbormon and the other warrior spirits then manifested to deliver the final series of blows that destroyed his Larva Mode. Arbormon first appears in “Fear and Loathing in Los Arboles.” His voice is supplied by Richard Cansino. An Armadillomon was among the many Digimon at the Autumn Leaf Fair when it was visited by the DigiDestined, and there was still one there when they returned to help protect it from the Royal Knights. Also, when Petaldramon’s Chamelemon minions were defeated in battle and had their Fractal Code scanned by Kumamon, they reverted into Armadillomon, and fled. Name: From “armadillo,” a hard-shelled mammal. Name: A corruption of her original Japanese name, "Archnemon," which is a misspelling of "Arachne," the spinstress in Grecian mythology who was transformed into a spider by Zeus. While trapped within one of Sakkakumon’s spheres, in a volcanic landscape, Tommy was attacked by a three-faced, multi-limbed monstrous Digimon, and fled in terror. His pursuer disappeared as quickly as he had materialised, however, and was replaced by a hooded figure who professed to have chased the monster away, and introduced himself to Tommy as Asuramon. They both went looking for the other DigiDestined, with Asuramon being overly friendly all the way, until Tommy disagreed with his choice of direction. Asuramon claimed that he should do as he said, as he had saved his life, but Tommy’s memories of his brother made him realise that friendship didn’t work that way. Asuramon burned his cloak away, revealing himself to be the multi-limbed Digimon who had attacked Tommy earlier, and demanded the boy hand his Spirit over. Tommy became Kumamon, and battled Asuramon, ignoring his twisted attempts at friendship and managed to topple him over a cliff into a river of a lava. Not that it had any effect, however – Asuramon emerged seconds later, only to be soundly defeated and have his Fractal Code scanned when Kumamon became Korikakumon. Name: From “Asura,” a demon from Sanskrit, who the Devas battled against. The Autumn Leaf Fair lies nestled somewhere in the Digital World’s land of ice, kept warm by the large furnace around which the fair is built. The DigiDestined arrived there while pursuing the Toucanmon who had stolen their D-Tectors, and a search of the fair eventually resulted in Tommy discovering that they had traded them with Datamon. His attempts to find something to trade to get the D-Tectors back failed, but by rescuing the Toucanmon from a broken ice field, he proved to Datamon that he was honest and truthful enough to have the D-Tectors back. Arbormon also followed the kids to the fair, however, and Tommy engaged him, as Petaldramon, in the form of Korikakumon. Later, when the Royal Knights were gathering the data of the Digital World for Lucemon, the Autumn Leaf Fair was one of the last areas remaining. While Zoe, Bokomon and Neemon co-ordinated Trailmon departures to get all the inhabitants to safety, and the others built a snow catapult to try and hold the knights off, J.P. operated the levers in the furnace to reorganise the layout of the fair, breaking up its Fractal Code to make it unable to scan. However, in the ensuing battle, Dynasmon uncovered all the pieces of the broken code, and reassembled them, enabling Crusadermon to scan the fair’s data.